Sadiq Khan has suggested he could back a second referendum on the EU if parliament rejects any deal between Theresa May and Brussels. The London mayor said any move by MPs to knock back the government’s proposal would “open up” what happens next. He spoke out just 24 hours after Emily Thornberry, his former shadow cabinet colleague, said May was heading for a “no deal” outcome with her EU negotiators. 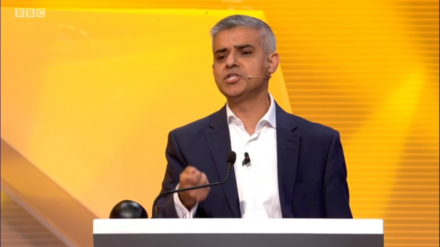 Today Khan appeared to go further than his previous demands – which have concentrated on protections for the City of London and a “qualified” form of freedom of movement after Brexit – when he raised the prospect of another national vote after May has drawn up a proposal for parliament on the terms of departure from the EU. “I think it depends how Parliament votes surely – if parliament was to vote in favour of the deal our government does then that makes redundant, I suspect, the referendum,” he told the Today programme on BBC Radio 4. Khan, who played a lead role in Labour’s pro-EU campaign in summer 2016, above, said that if the Commons voted to reject any deal struck between May and chief EU negotiator Michel Barnier then it would change the dynamic of politics. “Either our parliament is sovereign, or it is not. If parliament rejects the deal done by our government then of course that raises a whole host of questions,” he said. The former cabinet minister highlighted as two key issues for May the rights of EU citizens living in London and a minimum two year transition period to give certainty to business.